The good news about land is that I’m getting more inquiries about land sales than I have in a few years. The bad news is that about half of them are owners wondering if land is selling any better than it has. The answer is not really. 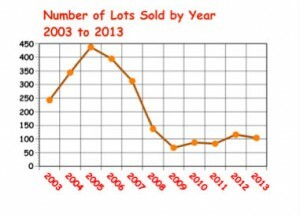 Since 2009 when only 68 lots sold all year, land has climbed back up to a little more than a hundred sales per year. And prices are stuck in the $300,000 average range. If it weren’t for several $1 million plus sales near the lifts in Breckenridge each year, average prices wouldn’t be that high. Three Peaks on the Raven Golf Course in Silverthorne is a good example how the land market has done in the past fifteen years. This high-end neighborhood was one of the last to be subdivided in the county. Three Peaks launched in 2000 and for the next five years, land prices averaged $249,000. For the next five years through the peak of land prices in 2008, prices averaged $299,000. During this time, several lots were flipped in as little as six months for gains from $50,000 to as much as double what was previously paid. For the past five years, Three Peaks prices have averaged $234,000, lots have sold for an average 90% of list price, and it has taken an average of 330 days for them to sell. In March of this year there were 29 active Three Peaks lot listings averaging 515 days on market. One had sold in the previous twelve months. In late March there were 307 lots for sale in all of Summit County averaging 688 days on market and a median $295,000 asking price. 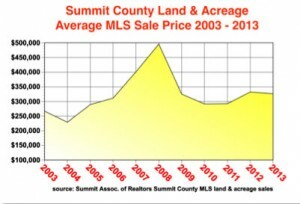 104 lots sold in Summit County last year but there have been routinely 350 or more for sale at any given time. Obviously the whole land market is overpriced for today’s conditions. Most of these owners are just hanging their lots out there at these prices in hopes of a sale even though a rational plan would be to reduce until land begins to sell again. But most owners have no debt on the land and only taxes to pay so they are willing to wait. It will take the return of lenders to the construction market for that to happen and there’s no sign of that yet.